Senate Judiciary Committee Chairman Chuck Grassley (R-IA) fired off a letter to the Department of Justice Wednesday demanding unredacted versions of text messages between FBI agent Peter Strzok and former bureau attorney Lisa Page, including one exchange which took place after Strzok had returned from London as part of the recently launched "Operation Crossfire Hurricane" - referring to the White House "running" an unknown investigation. After Senator Ron Johnson (R-WI) fought tooth-and-nail for their release, the DOJ provided heavily redacted texts on May 1 and May 18. 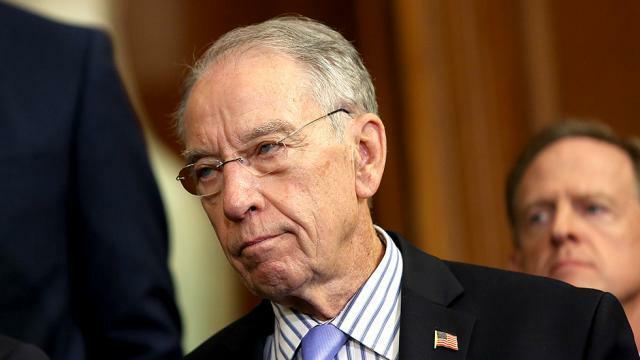 The visible portions of the texts, however, are troubling in light of recent developments - prompting Grassley's request for unredacted copies. "As one example of redacted material, in a text message produced to the Committee, the price of Andrew McCabe’s $70,000 conference table was redacted." "In another, an official’s name was redacted in reference to a text about the Obama White House ‘running’ an investigation, although it is unclear to which investigation they were referring"
What's notable about the message referring to the White House is that Strzok had returned from London to interview Australian ambassador Alexander Downer about a drunken conversation with Trump campaign aide George Papadopoulos, who - after reportedly being fed information - mentioned Russia having Hillary Clinton's emails. Grassley requested that the DOJ turn over unredacted copies of the exchanges by June 6. Strzok and Page were kicked off of Special Counsel Robert Mueller's Russia probe over the summer when the Justice Department's Inspector General, Michael Horowitz discovered over 50,000 texts between the two FBI employees - many of which showed clear bias for Hillary Clinton and against Donald Trump. “Based on the meeting with the President, the Department of Justice has asked the Inspector General to expand its current investigation to include any irregularities with the Federal Bureau of Investigation’s or the Department of Justice’s tactics concerning the Trump Campaign,” a White House statement said.